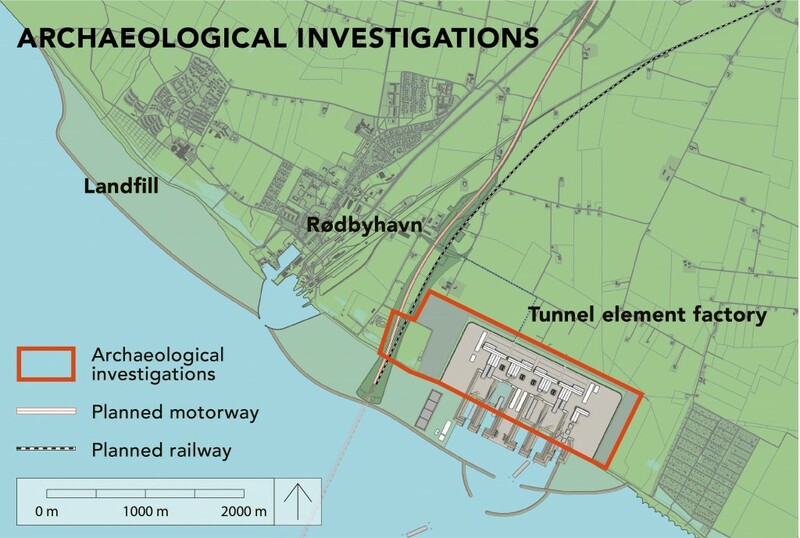 Archaeologists are preparing to search for ancient monuments before construction work on the Fehmarnbelt fixed link begins. Investigations will be carried out both in a coastal area on the mainland and on the seabed in the Fehmarnbelt. In early May 2012 The Museum Lolland-Falster will undertake a survey of a site east of Rødbyhavn measuring almost 2 sq. km. in order to establish whether excavations need to be carried out. Around the same time the Viking Ship Museum in Roskilde and the State Archaeological Department of Schleswig-Holstein will start examining two shipwrecks dating from the 1600s lying at 22–25 metres’ depth in the Fehmarnbelt. Archaeologists from The Museum Lolland-Falster will be employing new methods not yet used in Denmark. Initial tests established that it would not be possible to undertake a traditional preliminary investigation using trial trenches because of the way the landscape has been transformed in the area, something that becomes evident when groundwater levels are high. In the first phase of the preliminary investigation archaeologists from The Museum Lolland-Falster will be working with Dutch and German specialists to obtain more than 1,600 drilling samples taken at intervals of around 35 m. The drill core samples will have a diameter of 7 cm and may be up to 4 ½ m long – depending on whether the machine can reach soil layers untouched by man. This method has previously been used to locate ancient monuments in dammed up areas in Holland. The Museum Lolland-Falster has also formed a partnership with Moesgård Museum in Århus, which will carry out a scientific examination of the drill cores. The drill cores will be examined at The Museum Lolland-Falster field station near the archaeological site, where the archaeologists will be able to take a first look back in time and see what thousands of years of history have to tell us. The archaeologists are expecting to find traces of the very earliest settlements in Denmark. Early life in Lolland was centred around the coastal areas, where hunters and fishermen had settled. The oldest find yet to be excavated in the Rødby region dates back to 8500 BC. The marine archaeological investigations are focusing exclusively on two shipwrecks from the 17th century identified during earlier preliminary investigations. The wrecks are located at a depth of 22–25 m, and during May and June 2012 experienced divers will carefully examine the wrecks and recover items to be preserved for posterity. One of the shipwrecks lies in German waters around 3 km north of Puttgarden. It is thought to be the Danish warship Lindormen, which sank in October 1644 during a naval battle with a Swedish-Dutch fleet. The location of the shipwreck has been in the public domain for several years, and the archaeologists therefore expect the wreck to have been partially looted by amateur divers. Unlike Lindormen, the second wreck, located in Danish waters around 8 km south of Rødby, has not yet been examined, and the archaeologists are therefore expecting a number of interesting finds. It is not yet known whether the two shipwrecks originate from the same naval battle. Both wrecks are protected by Danish and German legislation respectively and will therefore be examined more closely to allow the authorities to decide how to best preserve the finds for the future. The State Archaeological Department of Schleswig-Holstein carried out archaeological investigations near Puttgarden on the German island of Fehmarn in 2008, 2009 and 2011. The investigations described the archaeological potential and registered ancient monuments over an area of around 1.2 sq. km. where the future alignment and construction site will be. The numerous archaeological finds identified across the entire site show extensive settlements dating back to the Neolithic Age (4,300–1,800 BC). The investigations found remains of settlements dating back to the pre-Roman Iron Age (550–50 BC). These remains will be examined further before construction work on the fixed link begins. Settlements from this period are almost unheard of in Schleswig-Holstein.